It’s a match made in heaven my friends! Pumpkin Pie and Fudge – creamy white chocolate fudge with pumpkin and pumpkin pie spice – you really must add this to your holiday baking list! Many moons ago I thought making fudge was only for experienced candy makers. Using a candy thermometer seemed difficult and a crazy thing to figure out. But after I figured out that 1) making fudge is really easy and 2) you really don’t have to use a candy thermometer if you don’t want to, I was super excited to try more flavors. Now, a few years later, I have made fudge several times. From flavored fudge that you cook on the stovetop – Cotton Candy Fudge – to Caramel Apple Fudge that only has 2 ingredients – to Peppermint Fudge for the holidays – and even multi-colored White Chocolate Fudge. So needless to say, I’m a little hooked on fudge. 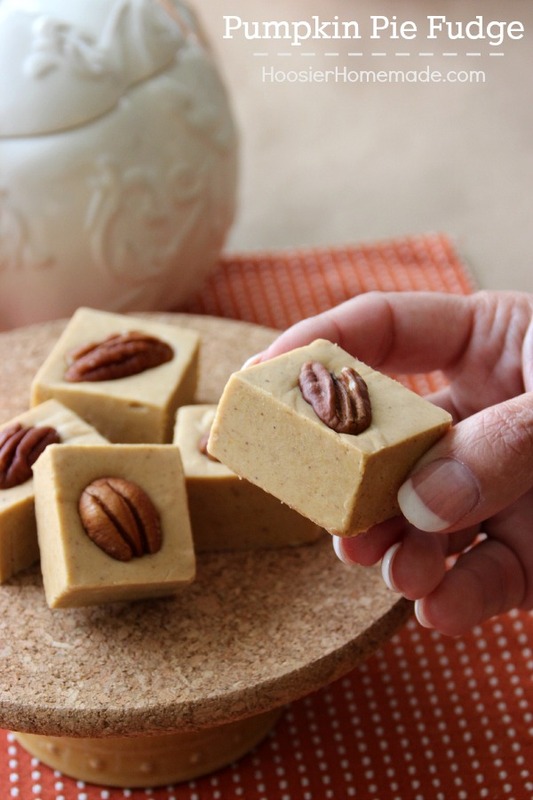 After making all of the other homemade fudge recipes, it was time to give Pumpkin Pie Fudge a try. Because of course, it’s November, it’s time for Pumpkin Dessert Recipes…everywhere! So I knew the Pumpkin Pie Fudge Recipe needed to be easy, because well, I’m all about simple and easy, but it needed great flavor. So I started with the same recipe I have used for most of the fudge recipes I have already made, which also happens to use Truvia Baking Blend and heavy whipping cream. I followed the directions on my other fudge and let it boil for 5-7 minutes. Then…big fat fail! Yes, the fudge tasted delicious but it didn’t set up well. So then I needed to figure out what went wrong, the only thing we can figure out is the fat in the heavy whipping cream and the liquid in the pumpkin just didn’t like each other. So changed the whipped cream to Evaporated Milk, and decided to use a candy thermometer this time around. If you don’t have a candy thermometer, you can test the mixture by dropping a small amount into a chilled water, it should form a soft, flexible ball. It will also pull away from the sides of the pan. Canned pumpkin adds liquid to your recipe, so you will take that into consideration when cooking. The cooking times could vary depending on what kind of canned pumpkin you use. Of course, if you are adding canned pumpkin to muffins or bread, the extra moistness is a good thing. Fudge – not so much. Truvia has a new brown sugar blend, and I’m a HUGE fan of it. It’s soft, tastes great and also has 75% fewer calories than brown sugar per serving, remember I used it in my Homemade Caramel Sauce that has only 5 ingredients and by the way – you don’t need a candy thermometer, just like the fudge recipes. 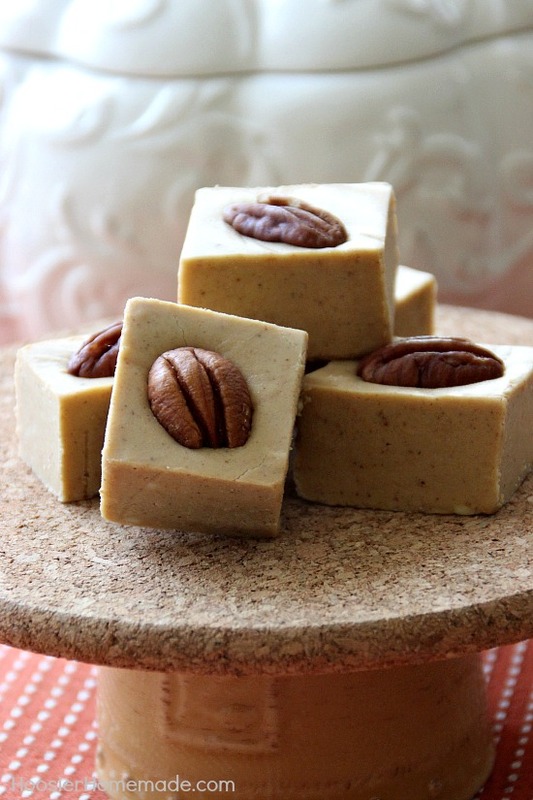 This Pumpkin Pie Fudge Recipe goes together in a snap too! Besides the Truvia Brown Sugar Blend and Baking Blend, I added marshmallow creme, evaporated milk, butter, white chocolate chips, pumpkin pie spice, vanilla and of course, pumpkin. And then I garnished each piece with pecans. You can also chop the pecans and add them to the fudge. Combine Truvia Baking Blend, Brown Sugar Blend, milk, pumpkin,butter and pumpkin pie spice in a medium saucepan. Bring mixture to boil, stirring constantly, add candy thermometer to side of pan. Boil until mixture reaches the soft ball stage, 234° to 240º F. Mine took 20 minutes, cooking time will depend on how much liquid in the pumpkin. Carefully pour hot mixture over chips and marshmallow creme, stirring immediately and vigorously - you want the chips to melt quickly, because when the mixture cools down they won't melt. You can also put this recipe in a 13x9 pan, the fudge will just be less thick. Thank you so much for this delicious recipe! I live fudge and I certainly indulge in it during the holidays! With trivia I dont need to feel guilty about it! Awesome! Oh wow, I am in love!! 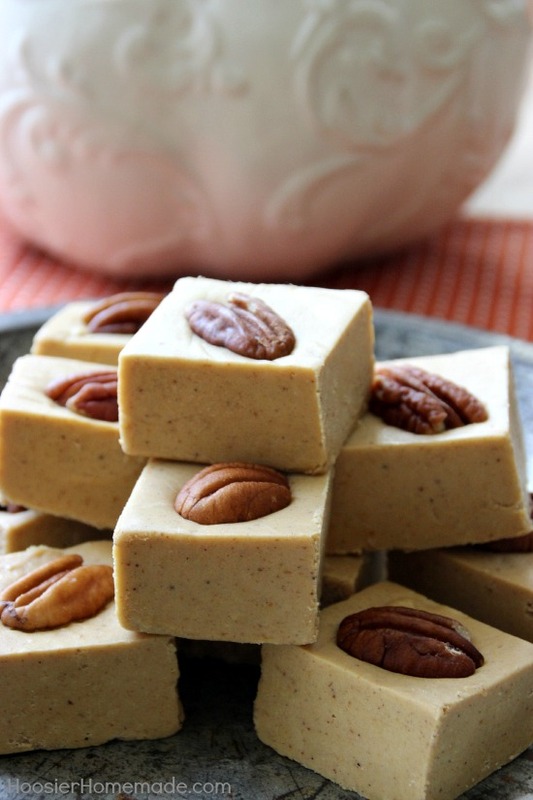 I can’t wait to make this fudge!! Candy making still terrifies me. 🙁 But this fudge looks worth getting over it for! So creamy looking. Thanks so much for stopping by Erin! I agree, candy used to terrify me too. This looks fabulous! A must-try for the holidays! Fudge is one of my favorite things to make over the holidays. My neighbors would be thrilled if I gave them some of this pumpkin fudge! These look great, LIz. I cant wait to try it – because like most everyone, I love pumpkin anything. This fudge looks fantastic! I love using the Truvia brown sugar blend. It’s so delicious! Great idea- looks delicious! 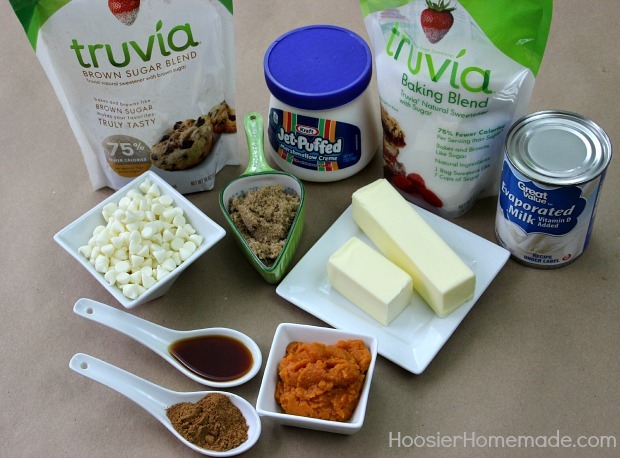 I haven’t experimented baking and cooking with Truvia yet. I’ve been curious though, so I’ll be checking out some of those links you shared! Can you use regular sugar and brown sugar instead? 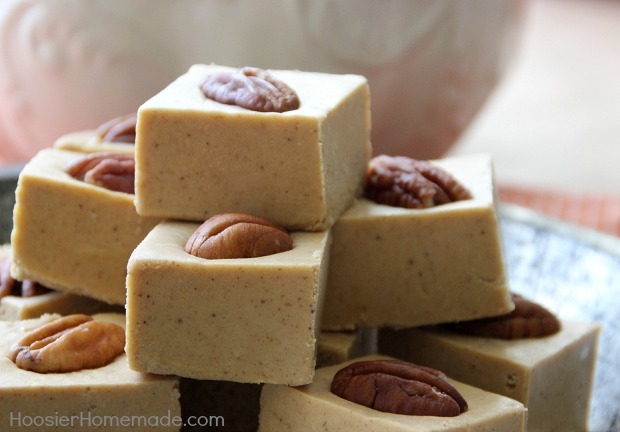 I don’t have those items in my pantry and can’t afford to go out and buy them right now but would love to make this fudge. Hi Marnie, yes you can use regular sugar and brown sugar in this recipe. Just replace with 2 cups of sugar and 1 cup of brown sugar.